“Carnegie Mellon University’s largest student-run fundraising event,” boasted the program for Greek Sing 2012. With over 1,000 participants from the Greek community representing 17 different chapters, the event managed to raise over $55,000 for The Children’s Institute of Pittsburgh. The philanthropy award, given to the house that raised the most money on its own, was awarded to Delta Gamma for raising over $8,000. The Greek Sing chairs — Jake Yosafat, a senior business administration and ethics, history, and public policy double major in Alpha Pi Epsilon, and Harold Kim, a senior information systems and human-computer interaction double major in Sigma Alpha Epsilon — also served as the masters of ceremonies for the evening’s festivities. Both have served as the Greek Sing chairs of their individual houses, and Yosafat saw the opportunity as “one last final way to give back to the Greek community,” with Kim echoing his sentiments. Yosafat and Kim aided in moving the show along with witty banter between performances that kept the audience laughing. Laughter was a big part of the show as a whole: Most groups used slapstick and lowbrow humor, which the audience responded well to. The first competitive performance, Beta Theta Pi, embodied this spirit and took the time to make fun of itself, showcasing the good-hearted spirit of the event and reminding audience members that the show is about giving back to the community. Similar to Beta Theta Pi’s seven-foot man in drag, Delta Delta Delta and Lambda Phi Epsilon had a cast member don an afro larger than his head that covered his entire face. This exaggerated humor was a big theme, and helped keep the entire event engaging. The competition was broken into two acts: singles performances and doubles performances. After over two hours of competition and a video on The Children’s Institute of Pittsburgh, the scores were finally tallied. Kim and Yosafat awarded two Chairmen’s Choice Awards, an award for the houses they deemed the easiest to work with and that helped the event run smoothly. This year’s recipients were Delta Delta Delta and Kappa Kappa Gamma. After much anticipation, awards were presented starting with singles third-place winner Alpha Kappa Delta Phi. The members of Alpha Kappa Delta Phi competed in the event for the first time this year and performed their own rendition of Disney’s Tangled. In second place for singles competition was Pi Delta Psi for its unique twist on Willy Wonka and The Chocolate Factory. In the group’s version of the show, Willy Wonka turns out to be Michael Jackson in disguise, thus explaining why three boys were lured to a land of candy and magic without the accompaniment of their parents. The singles winner was Alpha Epsilon Pi, whose members performed Death of a Salesman. Managing to keep the plot of their show a secret until the performance, their show chronicled the death of a very well-known salesman of our day: Billy Mays. Beginning with his early days selling lemonade and continuing up to a clever scene in which he literally and figuratively “fell off the wagon,” the show was a pleasant surprise for audience members expecting a more traditional Death of a Salesman. Doubles winners were some of the the most anticipated awards of the night. This year’s third place winners were Delta Gamma and Delta Tau Delta with their take on Tarzan. Second place went to Kappa Alpha Theta and Sigma Phi Epsilon performing Across the Universe. 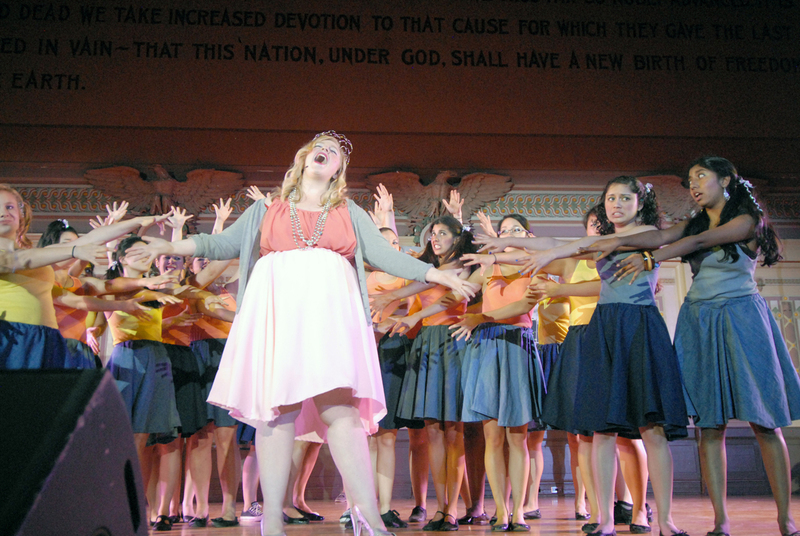 Vocal talents reigned in their performance, and the leads and soloists blended well once the show was under way. Both groups utilized the size of their ensembles and performed large group numbers with difficult choreography. This year’s doubles winners were Alpha Chi Omega and Sigma Chi, whose members performed Footloose. The show included innovative rotating set pieces, as well as a lot of musical and dancing variety from one number to the next. The men of Sigma Chi performed a number in the show with no musical accompaniment that seemed to wow the audience. Despite the time constraint, the group managed to include a variety of set pieces, dance moves, and singing styles. The night began and ended with non-competitive performances from sororities Kappa Phi Lambda and Alpha Kappa Alpha. Each group of women performed routines focused on stepping. Yosafat and Kim explained that more than 20 different organizations were involved in the night’s performances including the Greek houses, media outlets, the alumni association, and staff from all over campus. Such widespread involvement is indicative of the spirit of the event, and, together, everyone’s hard work managed to generate over $50,000 for a great cause.